After 13-year-old Theo Decker miraculously survives an accident that kills his mother, he clings to the one thing that reminds him of her: a small, mysteriously captivating painting that ultimately draws him into the underworld of art. Ms. Tartt has made Fabritius’s bird the MacGuffin at the center of her glorious, Dickensian novel, a novel that pulls together all her remarkable storytelling talents into a rapturous, symphonic whole and reminds the reader of the immersive, stay-up-all-night pleasures of reading … It’s a work that shows us how many emotional octaves Ms. Tartt can now reach, how seamlessly she can combine the immediate and tactile with more wide-angled concerns … Ms. Tartt is adept at harnessing all the conventions of the Dickensian novel — including startling coincidences and sudden swerves of fortune — to lend Theo’s story a stark, folk-tale dimension as well as a visceral appreciation of the randomness of life and fate’s sometimes cruel sense of humor. The Goldfinch is a virtual baby: it clutches and releases the most fantastical toys. Its tone, language, and story belong to children’s literature … To be fair, Tartt has considerable talents in the field of magical misdirection...but misdirection is practiced evasion, and narrative secrets are tested by the value of their revelations: we will need, as bounty, more than the prestidigitator’s ace of spades … Through all this thrashing, twisting, gulping, choking, gasping, coughing, cursing, plunging, sputtering, and floundering, I kept on trying to imagine a different novel, stripped of its unreasonable raison d’être and its childish sweets. 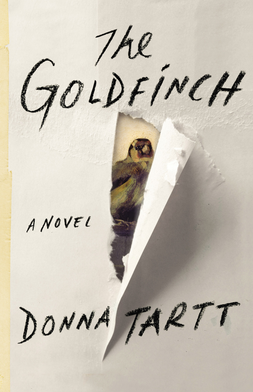 What did you think of The Goldfinch?